Outdoor Gear: Who Let The Dogs Out? Americans in the 21st century are obsessed with trying to live healthier lifestyles. Granted, the level of obsession varies according to individual and geographic location. Nevertheless, there is a marked trend toward healthful living, which in turn has inspired many people to adopt outdoor pursuits. Hiking, camping, boating, cycling-all are enjoyable activities that promote health and fitness. As more and more people get outside, an increasing number of individuals are looking for ways to take their pets with them, especially their dogs. From a historical perspective, this makes perfect sense. Canines have been helping humans meet the challenges of nature since before recorded history began. And in the 21st century, if you want to take your dog with you into the wild, you can purchase a variety of devices to get the most out of the experience. Some people chose to take their dogs with them when they go hiking. Needless to say, most dogs love this. The smells, the dirt, the wild animals-it’s a doggie paradise. However, some hikers chose to make their pets work for their fun. Dog packs have become fairly common in the world of animal hiking. These packs are designed to fit a canine, allowing it to carry some of the load without inconvenience or discomfort. Dog packs are padded, durable and usually fairly formfitting, allowing the dog to move through reasonably dense undergrowth without becoming hung up. Some dog packs feature a built-in handle on the top, which the owner can grasp to help the dog on particularly difficult bits of trail. 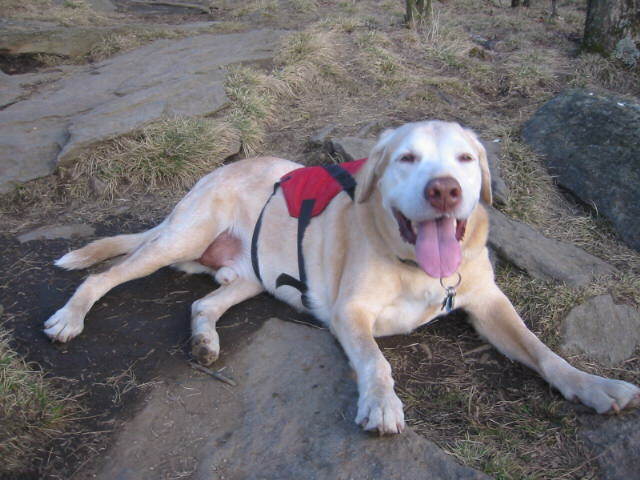 Dog packs are extremely convenient for owners who hike with their dogs, as they allow the pets to share the work. Sometimes, taking your dog with you on an outdoor adventure can mean exposing him or her to some fairly harsh elements. For those pet owners concerned about their dogs’ health, water proof and windproof canine jackets can be purchased. Such jackets are made of materials like Teflon and Lycra, which resist both moisture and dirt; fleece is often used as a liner for warmth and to avoid chafing. Many dog jackets are brightly colored or feature reflective trim in order to make the dog more visible in dim light. Although most dogs want to follow their owners to the ends of the earth, sometimes that just isn’t possible without a little help. Dogs’ pads do not contend well with all groundcover, especially rocky trails and snow fields. Fortunately, owners can purchase dog boots to help their pets. These boots have fairly heavy treads on the bottoms, providing the traction that dog pads lack. They are designed to be comfortable and to remain securely on the dogs’ paws. If you’re taking your dog out on the sailboat, you want to be sure that he will not be in danger of drowning if he goes overboard. Sailing dogs can be equipped with float coats, floatation devices designed to keep dogs above water and to work with a canine’s natural swimming position. Most float coats have a handle on top by which the dog can be hoisted out of the water.